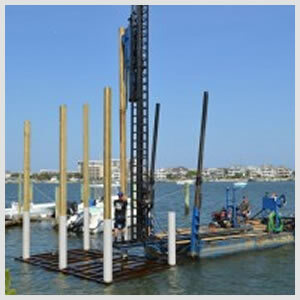 Logan Marine provides marine construction services for North Carolina property owners with a focus on: pile driving, bulkheads, floating docks repairs and construction, piers, gazebos and boat lifts. 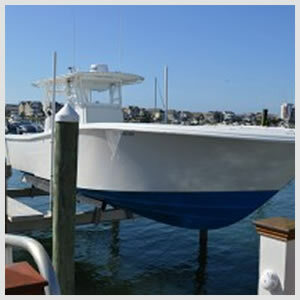 Our primary company goal is to design and build structurally sound marine projects that are pleasing to the eye and able to withstand the severe weather that is so common in southeastern North Carolina. Driven Pilings... The most supportive AND held down installations available. We use a Marine Pile Driving Barge, manufactured out of steel, engineered specifically for driving deep foundation piles. Piles are hammer driven with 10,000 ft/lbs. of impact in every blow. This is very important because A) When flood waters rise and waves roll in your wooden pier will float if it isn’t properly held down and B) Your pilings may sink when any substantial amount of weight is applied to them, such as boat lifts or gazebos, if not properly driven. Piers & Gazebos, Built to Last AND Look Good! 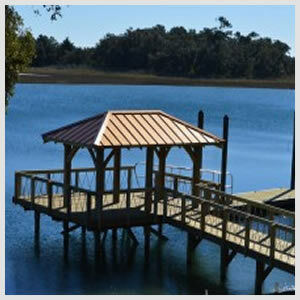 We understand that you want your pier and gazebo to be strong... but we say it can be strong AND look good, for years to come. Attention to details, design & functionality, quality materials, correct wood preservatives, stainless steel fasteners, concealed girders, predrilled decking, continuous roof support piles...it's all the little things that add up to one big thing: a docking & entertainment facility that you can be proud of for many many years. We are also happy to accessorize with custom handrails, lighting, plumbing, fish cleaning stations and much much more. Some will weather the storm, some will not. We say Dock Solid, and that's what we deliver, from the top down to your kayak launch. Heavy timbers treated to AWPA Standards, HDG steel brackets & bolts, polyethylene float tanks, 316 grade stainless steel screws. NO NAILS. 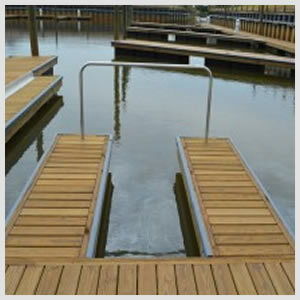 We build and repair floating docks. Dock Solid... for many years to come. Whether you need a Boat Lift, Jet Ski Lift, Yacht or Commercial Lift, we will provide a custom solution to meet your requirements. We are the area's premier dealer for Golden Boat Lifts. Every Golden Boat Lift comes with a 15 Year Structural Waranty, 10 Year SEA Drive Gear Waranty and a 2 Year Electrical Waranty. Only the best boat lift has the best waranty. When it comes to marine construction, only the best will do. That's why our clients know that hiring us means they are taking the risk out of the hiring decision. If your dock, pier, boat lift or gazebo has taken a beating and needs to be replaced, all we ask for is the opportunity to demonstrate our capabilities. We appreciate this opportunity to earn your business. We realize what it takes to acquire your trust, what it takes to give you the results you demand and what needs to be done to eliminate many of the headaches and frustrations people have with marine construction projects. Thank you for your time and we look forward to working with you. If you would like to schedule an onsite review of your project please call us at 910.367.1348 . Looking for top-rated marine construction service near you?